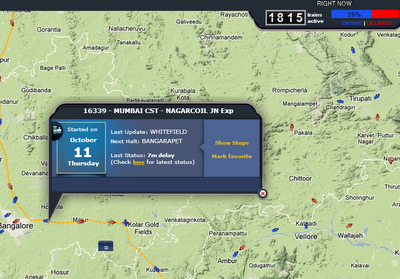 Rail Radar: How to Live Locate Indian Railway Trains in Google Map!! Indian railway launched live locator for the trains running on the Indian railway tracks with the help of the Google Maps. When you launch the web site you will get the Indian map with train indicators and you can zoom-in and zoom-out as like in Google Maps. 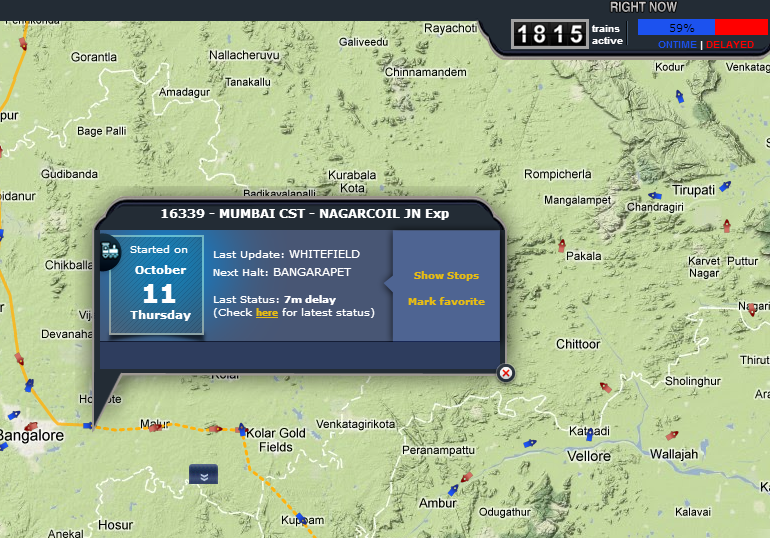 Easily you can locate the train located to your particular area when you do a zoom in the map again. In the map you can see the red and blue arrow which indicates the trains and its direction. The blue marked arrows are the trains running on right time and the red ones are the trains running on delay or late on scheduled timings. The website or map has the counter for the total number of trains tracked and how much percent of the trains are running in right time and late timings. There is one search option is also provided in the left hand side of the web page where you can type your train number and search for the location. It is wonderful initiative from Indian railway.